Welcome to another Monday Montage Blog Hop!! 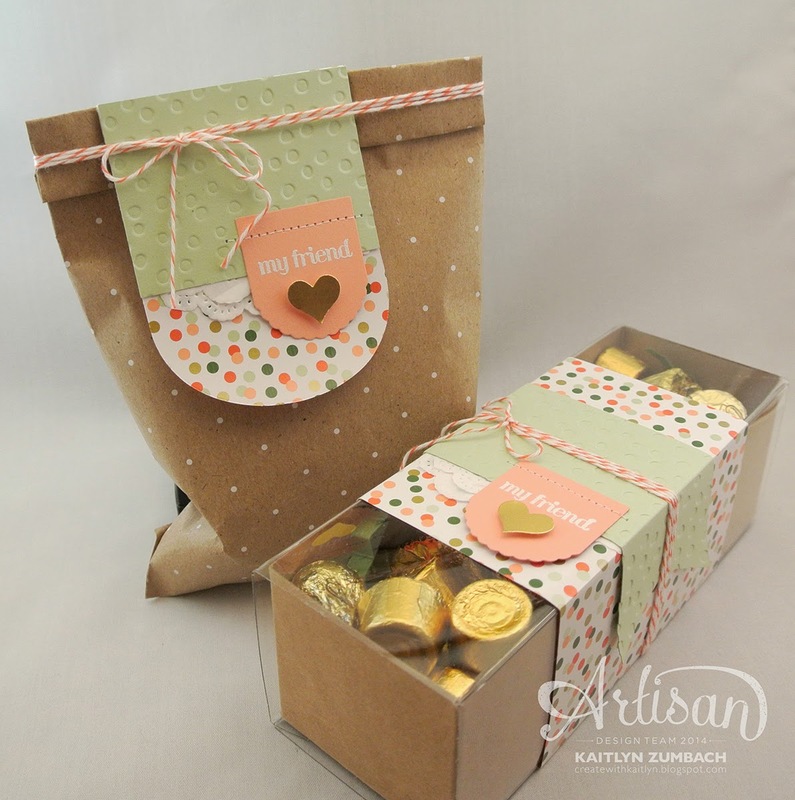 Today I wanted to share with you some gift packages that I made with the Gold Soiree Designer Series Paper. I love this specialty DSP! It has a great feel and some awesome gold foil touches. I did two versions of the same design. 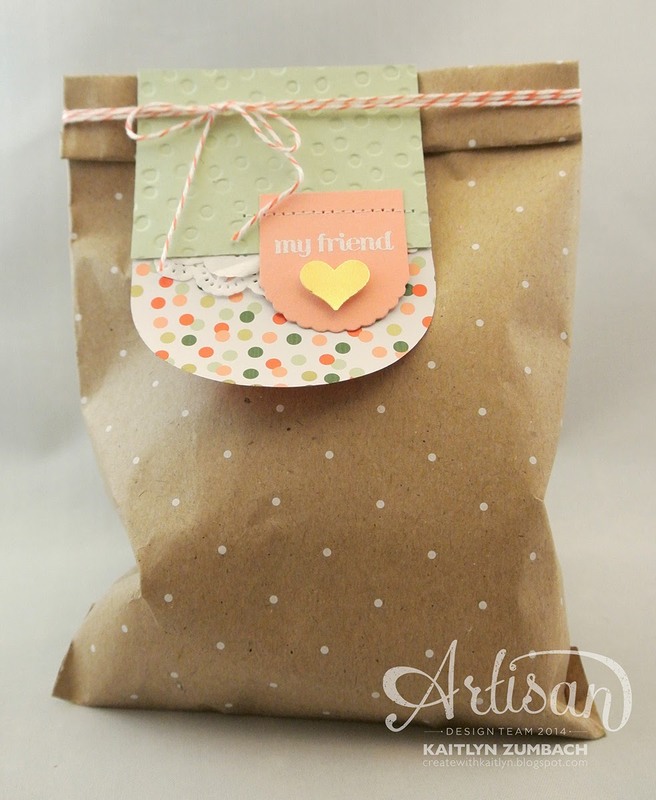 The first was with the Tag A Bag Gift Boxes, and then I reconfigured it using the Polka Dot Tag A Bag Gift Bags. These boxes and bags are great for creating quick packages! They can hold just about anything, their neutral kraft color will go with anything, and I really love how the bags are pre-printed to add a little fun to them! For the boxes I made a belly band out of a piece of the Gold Soiree DSP and then added a Pistachio Pudding banner that goes around to the sides. The Decorative Dots Embossing Folder reflects the pattern of the DSP perfectly! I then wrapped some Calypso Coral Baker's Twine around the box several times and tied it in a pretty bow. 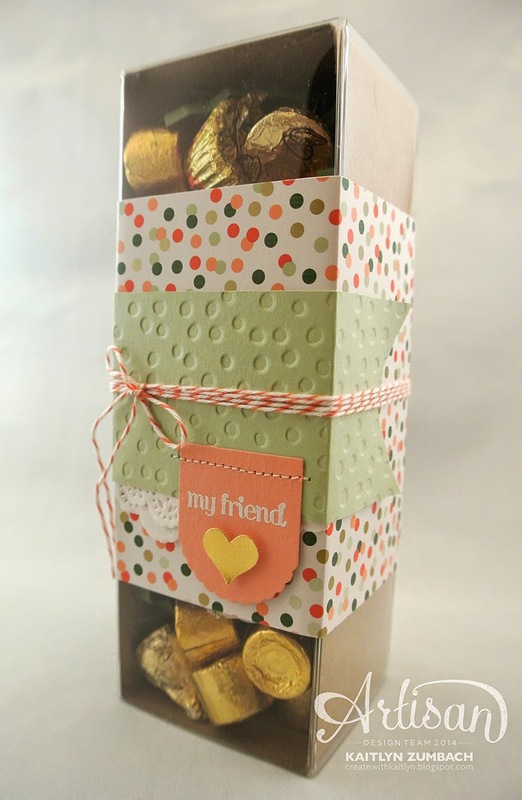 To really make this gift complete, I filled it with gold wrapped candies to match the DSP and the little gold heart. This really made it perfect!! Instead of doing a belly band for the bags too, I made a tag using the Party Pennants Die. A super simple switch up that still looks great! All of the little touches of some doilies, the gold heart, and stitching really make these packages special. I know everyone else has some awesome projects in store for you! So, be sure to hit the "Next" button below so you don't miss anything! These are darling, Kaitlyn! I love the pretty,little touches like the peeks of doily, gold hearts, embossing and stitching. All of those little details add up to beautiful projects. Such cute little treats! The little bits of stitching is the perfect added touch! Super cute! I love both! Sooo cute! I feel so lucky to have been a recipient of one of these at convention :) Thanks so much for the sweet gift and for sharing the project!